Could be called Snorri’s saga, as Snorri the Priest is born in chapter 12, dies in the last chapter (65) and dominates most of the action in between, if only as peacemaker between the various gangs which come to inhabit the Snæfelsness peninsula in north-west Iceland where it is set. He inhabits a larger proportion of the text than Egil or Njal do of their sagas. Eyrbyggja uses material from other sagas: chapters 12 and 13 give a brisk summary of the main plot of Gislis saga. In chapter 47 Snorri recounts the story of Gunnar’s last stand from Njal’s saga. The opening chapters about Ketil Flat-Nose seems to come from, or certainly parallel, the opening chapters of Laxdæla saga which also describe the reasons for Ketil leaving Norway for Iceland, and also echo the account in the Landnamabok. Towards the end the text refers overtly to Grettis saga and Bandamanna saga and Heidarviga saga and chapter 24 gives a summary of part of Eirik’s saga. At key moments in the Thorbrandssons versus Thorlakssons sections, the fights at Alftafjord and Vigra Fjord, the author quotes a long poem on the subject, the Lay of the Raven by Thormod Trefilsson, as well as poems supposedly created by the protagonists. Right at the end he quotes Gudny Bodvar’s-daughter as an eyewitness to the bones of Snorri, Bork the Stout and Thordis Sur’s-daughter being dug up and transferred to the new church at Tongue. Eyrbyggja definitely feels late – it feels as if the author had good written accounts of numerous sagas, long poems and short verses which had been handed down, along with factual accounts of key events and legends and ghost stories, all of which he used carefully to amplify and enrich his narrative. This strength is also its weakness as it lacks the clarity of narrative of Egils saga or Njals saga and suffers, especially in the final third, from feeling like an anthology of interesting legends and anecdotes. Still, for this very reason, its variety of tone and incident, and also because this is a very fluent and readable translation by Hermann Pálsson and Paul Edwards, complete with good map and useful notes, I’d be tempted to recommend this as a first saga for the beginner. 1 – Ketil Flat-Nose is a great chieftain in Norway and married to Yngvild. King Harald Fair-Hair forces Ketil to combat exiles from Norway who are ravaging the coast. Ketil packs wife and sons and sails to the Hebrides where he crushes the Vikings and makes peace with the local chieftains with no intention of handing them over to Harald who promptly confiscates all Ketil’s property in Norway. Ketil marries his daughter to the most powerful chieftain in Britain, Olaf the White. 2 – Ketil’s son Bjorn had stayed on in Norway, goes south to his father’s estates and expels the king’s men. In response Harald outlaws Bjorn and sends men to kill him. Tipped off, Bjorn sails south along the coast to a place named Mostur Island and takes refuge with Hrolf. 3 – Hrolf is a friend of Thor, in charge of Thor’s temple and has an impressive beard so is known as Thorolf Mostur-Beard. Thorolf sends Bjorn with his son Hallstein across the sea. When Harald learns Thorolf has been sheltering the outlaw Ketil’s son, he outlaws him. 4 – Thorolf consults his friend Thor who advises him to go to Iceland. He takes Thor’s temple, timbers and some earth. On sighting Iceland he throws overboard the high-seat pillars and vows to build where they land. They sail into a broad fjord which he names Breida Fjord. The pillars land at a promontory which he calls Thorsnes. Thorolf builds a farm Hofstad and a new temple. On the ness is a mountain which Thorolf declares so sacred that no man can look at it without washing, and he names Helga Fell. He institutes the Thors Ness assembly and the land is so holy no-one is allowed to poo there but must go out to an island just offshore known as Dritsker. 5 – When Bjorn rendevous with his family in the Hebrides, his father Ketil has died. He discovers his mother and brother have converted to Christianity and becomes alienated from them. They call him Bjorn the Easterner. 6 – After two years in the Hebrides Bjorn and his friend Hallstein Thorolfsson sail to Iceland, to Breidafjord where they settle and build farms. 7 – Other settlers arrive: Geirrod builds his home at Eyr, along with Ulfar the Champion and Finngeir. Vestar has a son Asgeir. Bjorn the Easterner dies, succeeded by son 1 Kjallak the Old who marries Astrid and has Thorgrim the Priest, Gerd and Helga – their descendants are many and known as the Kjalleklings; and son 2 Ottar marries Gro, has Bjord father of Vigfus and Osvif the Wise, father of Gudrun the ill-fated heroine of Laxdala saga. In old age Thorolf Mostur-Bear marries Unn and has a son Thorstein, nicknamed Cod-Biter. Hallstein, Bjorn’s sailing companion, has a son Thorstein, fostered by Thorolf and nicknamed Thorstein Surt. 8 – Geirrid sister of Geirrod of Eyr comes to Iceland and Geirrod grants her land. She has a son who grows up to be Thorolf Bjornsson a great Viking. He thinks the land his mother has too small and challenges Ulfar the Champion to a duel and kills him not before Ulfar wounds his leg so that he walks with a limp and is known as Thorolf Twist-Foot. Thorolf has a son, Arnkel (who will squabble with Snorri), and a daughter Geirrid who marries another Thorolf and has Thorarin the Black (who will kill Thorbjorn and be exiled). 9 – Thorolf the founder dies and is succeeded by his son Thorstein Cod-Biter. The Kjalleklings (descended from Bjorn the Easterner) are arrogant. At the Thors Ness assembly Thorgim Kjallaksson announces they will poo where they want and no longer go to Dritsker. Thorstein Cod-Biter, defending his father’s holy soil, musters his men and attacks the Kjalleklings driving them down to the beach where there is a big pitched battle with some deaths. 10 – Thord Gellir, at that time leading chieftain of Breidafjord, is brought in to make a settlement. He moves the assembly to a new location and makes Thorgim half responsible for maintaining the temple, from which point he is known as Thorgrim the Priest. 11 – Thorstein Cod-Biter dies. He had a son Bork the Stout then, aged 25, another baby he calls Thorgrim and dedicates to Thor to become a priest. That autumn shepherds see the north side of Helga Fell open revealing fires and the sounds of feasting and the names of Thorstein and comrades. The next day they learn Thorstein was drowned on a fishing expedition to Hoskuld Island. 12 – Thorgrim marries Thordis Sur-daughter of Dyrafjord and goes to live with his brothers-in-law Gisli and Thorkel. Thorgrim kills Vestein Vesteinsson at a festival and, the following year, aged 25 like his father, Thorgrim is killed by his brother-in-law Gisli at an autumn feast. A few days later Thorgrim’s widow Thordis gives birth to a son named Thorgrim after his father – Thorgrim Thorgrimsson. She marries her brother-in-law Bork the Stout and goes to live in Helgafell. Little Thorgrim is fostered out to Thorbrand of Alftafjord where he is so troublesome he acquires the nickname Snorri, eventually to become the famous Snorri the Priest. Thorbrand has five sons and these Thorbrandssons are blood brothers to Snorri. The fearsome Viking Thorolf Twist-foot has a son Arnkel. Thorgim Kjallakson who started the fight at Thors Ness has three sons: Brand, Arngrim who is so mean he is nicknamed Styr, and Vermund the Slender. Asgeir of Eyr has a son Thorlak who marries Thurid and has sons Steinthor, Bergthor, Thormod, Thord Blig (the Thorlakssons who are going to be involved in feuds) and daughter Helga. 13 – When he’s 14 Snorri travels to Norway funded by his uncle Bork. The following year he returns and there is much joking that his colleague wears elaborate clothes and armour, whereas Snorri rides a plain mare in a black cloak. One day 12 armed men walk into the hall at Helgafell led by Bork’s kinsman, Eyjolf the Grey (son of Thord Gellir, biggest chieftain in the area who made the peace in chapter 10) who announces his crew have just killed Gisli the outlaw. This is as Bork wanted because Gisli killed his brother Thorgrim. But it is bad news for Bork’s wife Thordis as Gisli was her brother. As she goes to serve them, Thordis seizes Eyjolf’s sword and tries to stab him, only succeeding in gashing his thigh. Bork pushes her and Eyjolf would attack her but Snorri steps in to protect her. Bork gives Eyjolf self-judgement and gives him ample compensation, who rides off feeling very dissatisfied with all his hard work for Bork. This widens the gap between Snorri and his uncle and foster-father Bork. 14 – Snorri kicks Bork out of Helgafell which rightfully belongs to him. He surprises Bork by being able to pay the price Bork names. Thordis divorces Bork for hitting her and takes half his belongings so Bork ends up with very little. 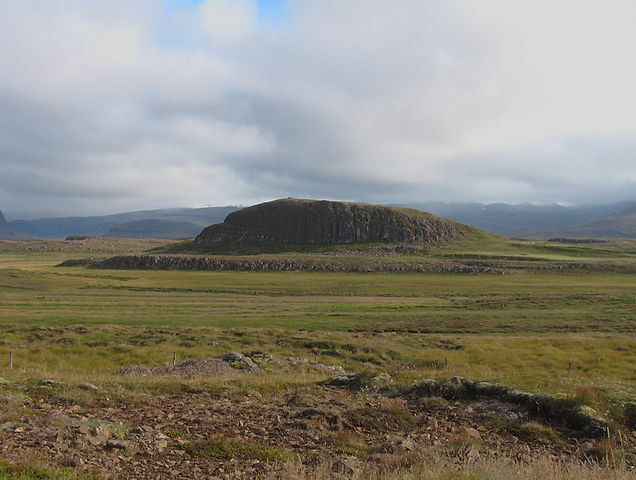 15 – Snorri’s farm at Helgafell flourishes and he becomes the priest of Thor’s temple. A widow called Katla lived at Holt, west of Mavahlid with her son Odd, a trouble-maker. Thorbjorn the Stout’s son Gunnlaug often goes to study witchcraft with Geirrid Thorolf’s-daughter. He stops in to chat to Katla and she insinuates that he makes love to Geirrid and that she fancies him. As he’s accompanied by Odd on these journeys he often stops off at Mavahlid and Katla always invites him in and he always refuses. 16 – On one of these visits Geirrid warns Gunnlaug not to go home. When he and Odd reach Holt, Katla invites him in and he refuses as usual. The next morning Gunnlaug is found almost dead covered in piercing deep scratches. He has been ridden by a night witch. Snorri and Gunnlaug’s father Thorbjorn ride over to Mavahlid and serve a summons on Geirrid for being a witch. But at the next assembly a lot of her kin support her and the case is rejected. 17 – At the same assembly a big fight breaks out, one side led by Thorgrim Kjallakson over the dowry of Illugi the Black’s wife. Men are killed before Snorri manages to separate the sides and broker a peace for which Illugi is grateful. 19 – Thorarin rides to see Vermund who advises they go see Arnkel. They know Snorri will prepare a case on behalf of Thorbjorn who was married to his half-sister. 20 – Geirrid of Mavahlid says it was Odd Katlason who cut off Aud’s hand. Thorarin and Arnkel ride to Holt: there is a strange folk tale scene where the men search the house for Odd three times but each time Katla bewitches them so they can’t see him. Only when Geirrid arrives do they put a bag over Katla’s head thus stymying her magic and find Odd. They hang him and stone her to death. 21- Arnkel advises Thorarin to go abroad. Message is sent to Bjorn the captain to ready his boat. 22 – On the Summons Days Snorri assembles a big force and rides to Alftafjord to summons the killers for manslaughter. Then he rides to the coast, seizes the Norwegian captain and burns the boat Thorarin was going to flee in. Whereupon Arnkel and Vermund and Thorarin row north across Breidafjord and buy another boat, and Thorarin and Vermund sail away. Snorri attends the assembly and successfully gets Thorarin and all his crew sentenced to outlawry, then confiscates all their property. 23 – Vigfus has a layabout nephew called Bjorn. At a big annual sorting of the sheep Bjorn accuses Snorri’ shepherd Helgi of stealing sheep and attacks him, Snorri’s uncle Mar Hallvardson goes to his defence and injures Bjorn. Vigfus takes the case to the Thor’s Ness assembly, but Snorri counter-charges Bjorn who is found guilty of starting. 24 – At the same assembly Eirik the Red is accused of a killing. His friends the Thorbrandssons gather supporters and Styr asks Snorri not to join the attack on Eirik after the assembly in exchange for his support any other time. They see Eirik off to a boat and he sets sail: it’s on this expedition that he discovers Greenland, in 986. 25 – The Swedish Berserks Vermund and Thorarin the Black arrive in Norway and go serve Earl Hakon the Good. With him are two Swedish berserks. The next year Vermund asks if he can bring them back to Iceland though Hakon warns him against. So he brings them back to Iceland where they soon start arguing. Vermund holds a feast for his brother Styr, Arnkel and other men of Eyr. He tries to persuade first Arnkel, then Styr to take the berserks and at first they get on well. 26 – Vigfus commissions one of his slaves, Svart, to kill Snorri. He breaks a hole in the ceiling of the porch and waits, but he thrusts down with his halberd just too late, misses Snorri and wounds Mar. Svart jumps to the ground but slips and is caught. Svart confesses it was Vigfus and Snorri sets off with six men, surprises Vigfus making charcoal in the woods and kill him. His slaves tell his widow who tries to raise support from Arnkel who refuses, saying it is the Kjallakings and Styr’s business. 27 – Vigfus’s widow Thorgerd goes to Styr asking for help. Styr points out the pledge he made to Snorri in exchange for Snorri not attacking Eirik. So, no help. She goes see Vermund who says, No help. She goes see Steinthor who says I’m too young. Exasperated she goes back to Vermund who says chop off Vigfus’s head and take it in a bag to Arnkel. Which she does and this shames and horrifies him into agreeing to launch a case against Snorri in the spring. But Snorri vigorously launches a counter action for attempted manslaughter and for the wounding of Mar, claiming Vigfus was lawfully killed. Moderators step in and Snorri agrees terms: he pays a large fine and Mar is exiled for three years. 28 – The end of the Swedish berserks One of them asks Styr for his daughter’s hand in marriage. Not keen, Styr goes consult Snorri and they go atop Helgafell: ‘plans made there have never been known to fail’. Snorri advises Styr to set the berserks two massive tasks, build a dyke and a sauna. When they enter the sauna Styr kills them. Snorri marries Styr’s daughter, Asdis, binding them together. 29 – Thorodd Tribute-trader and Bjorn Introducing Thorodd who goes a sailing trip to Ireland. Earl Sigurd of Orkney has just made a raid demanding tribute from the Isle of Man but is shipwrecked. Thorodd sailing by hears them shouting from the shore and, reluctantly sells them his two boat in exchange for the tribute. So people call him Thorodd Tribute-Trader. Back in Ireland he stays with Snorri at Helgafell and marries his sister Thurid, widow of Thorbjorn who Thorarin the Black killed after the dispute about horses (chapter 18) and they go live in the farm at Frodriver. Soon Bjorn Asbrandsson starts calling on her and rumours start. Thorodd unhappy. One day, going home, Bjorn is attacked by Thorodd and servants – who he wounds – and the two sons of Thorir Wood-leg (the Thorissons), who he kills. Thorodd asks Snorri to mount a case against Bjorn for killing the Thorissons. Bjorn is outlawed and banished for three years. Bjorn sails to Norway, then Denmark, then on to join the legendary Jomsvikings. 30 – Thorolf Twist-Foot is an old mean man who doesn’t get on with his son Arnkel. Thorolf gets Ulfar’s advice about the weather and haymaking but pays him back badly by getting his men to fetch in Ulfar’s hay as well. Ulfar rushes out to the fields furious, but withdraws in face of Thorolf’s threats and goes to see his son Arnkel for compensation. Thorolf refuses to listen to Arnkel, so he pays Ulfar the compensation then kills seven of Thorolf’s oxen and claims that’s his hay-price returned. Thorolf is livid. 31 – About Christmastime Thorolf has a feast, gets his servants drunk, and tells them to go burn Ulfar’s farm. Over at Bolstad Arnkel sees the fire, rushes over with men to put it out, and seizes his father’s slaves and hangs them in the morning. Ulfar wisely makes over all his property to Arnkel, thus gaining legal support against threats from Thorolf. But this angers the Thorbrandssons, whose freedman Ulfar was and who think the property should revert to them. Thorolf rides to visit Snorri and offers him ownership of the woods on Krakaness if he will take up the case against Arnkel for killing Thorolf’s slaves. Driven by need for the woods, Snorri accepts and prosecutes Arnkel who points out he prevented a burning. Mediators step in and award Snorri 12 ounces of silver per slave ie the minimum which he gives to Thorolf who abuses him. Thus Thorolf is angry, Snorri is angry and Arnkel is angry. 32 – Ulfar’s brother Orlyg dies and Ulfar quickly gets Arnkel to come take joint protection of his property. The Thorbrandssons are cross again, reckoning their freedman’s property should be theirs and go see Snorri who refuses to take up the case against Arnkel, seeing as how his previous case wasn’t a particular success. In the autumn Arnkel gives a feast. Ulfar attends. Thorolf bribes his friend Spa-Gils who needs the money to lie in wait and murder Ulfar, which he does then runs off. Arnkel sees what’s happened and sends men after Spa-Gils. Thorolf sees Spa-Gils running and sends men to the Thorbrandssons so they can get to Ulfar’s property and claim it. Arnkel’s men catch and kill Spa-Gils. Arnkel and his men are at Ulfar’s property before the Thorbrandssons arrive so they fail to claim it again! 33 – Thorolf Twist-foot becomes angry that Snorri is using up too much of the wood and rides to confront him. Snorri calls witnesses to confirm Thorolf giving it to him and Thorolf rides on to his son Arnkel at Bolstad, but Arnkel refuses to get embroiled in another law case with Snorri so Thorolf rides home to Hvamm livid, sits in his high chair and in the morning his staff find him dead. Arnkel knocks a hole in the wall behind Thorolf, has him pulled backwards and his body placed on a sledge pulled by oxen up to a burial place where they build a cairn over the body. 34 – Thorolf’s ghost haunts the valley: the oxen which hauled his body are ridden to death by demons; every animal that goes near his grave goes out of its mind; the ghost kills shepherd and sheep; any bird alighting on Thorolf’s cairn drops dead. The ghost haunts vigorously and drives his widow out of her mind till she dies. First the farm at Hvamm is abandoned, then the whole valley. Arnkel gets recruits, loads Thorolf’s corpse onto a sled and drags it miles away to Ulfarsfell Ridge where they rebury it in Twist-Foot’s Knoll. 35 – Arnkel inherits his father’s property & rights and gets just as cross as his father with Snorri for using Krakaness woods. He waits till Snorri’s friend Hauk is supervising some slaves loading timber onto pack horses, then attacks. Hauk lunges at him but Arnkel deflects with his shield and spears Hauk, takes the horses and wood. Next spring Snorri brings a case against Arnkel for murder but Arnkel argues that Haul attacked him and the case is defeated. Simmering tension. 36 – A man called Thorleif is an outlaw. He comes to Snorri asking for sanctuary; Snorri rejects him but after a long talk. Then Thorleif goes to Bolstad to ask sanctuary of Arnkel and while they’re talking Thorleif takes up Arnkel’s adze and tries to kill him but Arnkel is too fast and kills him. Word gets about that Snorri commissioned him. 37 – Snorri holds a big Winter feast. He gives gifts to the guests. As the Thorbrandssons leave he gives Thorleif Kimbi a fine axe and they make an agreement to kill Arnkel. One night before Christmas Arnkel is working with some of his men at haystacks. Snorri is tipped off and joins with the Thorbrandssons, 15 in all, to attack. Arnkel holds off a long time but is finally killed. Arnkel was mourned by everyone, for of all men in pagan times he was the most gifted. He was remarkably shrewd in judgement, good-tempered, kind-hearted, brave, honest and moderate. He came out on top in every lawsuit, no matter with whom he had to deal, which explains why people were so envious of him. 38 – Arnkel’s heirs are all women who don’t pursue the case very well. Only Thorleif Kimbi is outlawed. 39 – Thorleif takes ship to Norway. They are joined at the last minute by a stranger who turns out to be Arnbjorn Asbrandsson, going to look for his brother Bjorn (the one who was exiled and went off to join the Jomsvikings in chapter 29). After landfall in Norway it’s Thorleif’s turn to make porridge but Arnbjorn is still making his so after some argument Thorleif grabs the pot, spills Arnbjorn’s porridge out and walks away but Arnbjorn hits him on the neck with the ladle which was still very hot and marks him. Arnbjorn saild south to find his brother. 40 – After two years exile Thorleif Kimbi returns to Iceland pleased with himself. The same summer Arnbjorn returns with his brother, now known as Bjorn Breidavik-Champion. Together they are known as the Men of Breidavik. Arnbjorn settles at Hakki in Hraunhaven on the south side of the Snæfelsness peninsula. At a big gathering of farmers Bjorn bumps into Thurid, the housewife of Frodriver, over whose affair he was exiled. Bjorn resumes seeing Thurid. An upset Thorodd pays Thorgrima Witch-Face to cause a blizzard. Bjorn is lost crawls into a cave and only just survives three days cooped in the cave. 41 – Fighting between Thorlakssons and Thorbrandssons That spring at the Thornes Assembly Thorleif Kimbi (one of Thorbrand’s five sons, the Thorbrandssons) makes a marriage offer for Helga Thorlak’s-daughter, sister of Steinthor (Thormod, Bergthor, and Thord Blig, the sons of Thorlak, the Thorlakssons). He is rudely rejected by Steinthor and Thord. Next morning the Thorlakssons are walking by as the Thorbrandssons are playing the turf game. A great chunk of sandy turf hits Thord Blig on the neck and he turns to see all the Thorbrandssons laughing. Both sides draw swords and a fight starts. Eventually Steinthor and Snorri are brought in to make peace. 42 – The Thorbrandssons try to kill Arnbjorn That summer a ship puts in at Hraunhaven on the south of the peninsula. Snorri has business with it and rides south. He is joined by the Thorbrandssons, one of whom is Thorleif Kimbi who was humiliated by Arnbjorn who now lives at Hakki near Hraunhaven. They peel off from Snorri and attack Arnbjorn’s farm, climbing onto the roof but he fights them off, until Snorri returns and tells them to stop which, reluctantly they do. The Men of Breidavik arrive and both gangs are in the market at Hraunhaven in a very uneasy peace. 43 – Egil’s failed assassination attempt The Thorbrandssons tell their slave he will be freed if he sneaks into the autumn games and kills one of the Breidavik men, either Bjorn or Arnbjorn or Thord. People say Snorri advised Egil to hide in the hills until the pass was full of smoke of evening meals then sneak down and kill one. Egil does just that but as he enters the hut where Bjorn and Thord are making dinner he trips and they catch him. They extract the full story of his assassination mission before witnesses then kill him. (The strange incident of the talking head.) It is the custom to pay recompense to the owner of a murdered slave. Steinthor gathers a vast posse of nearly a hundred to ride to give payment. When he learns from spies that Snorri is sitting doing nothing Steinthor decides to reduce the party so as not to provoke anyone. Bjorn tells him he’ll regret it. 44 – The Battle of Alfta Fjord Snorri quickly musters his supporters and takes them to Karsstad telling everyone to behave. Stainthor rides up to the door, dismounts, nails a pich with 12oz of silver to the door, calls witnesses that he has paid the debt. As usual, it’s a woman taunting the men inside who make them furious and Thorleif Kimbi comes rushing out followed by the other hotheads and they start fighting. However Snorri comes out and gets them all to stop and promises Steinthor safe passage. However, he then discovers his 12 year-old son Thorodd has been injured by the very man he’s given safe passage and the red mist descends: they chase after the Thorlakssons and there’s a big fight up a scree called Geirvör. Eventually Aslak of Langadale and Illugi the Strong and Vermund the Slender and all their men come between them and stop the fighting. Snorri reaches out his hand to shake Steinthor’s who abruptly hacks at it with a sword, though the sword hits a gold arm-ring. Everyone pleads with Steinthor to make peace and eventually he does, a ceasefire till all sides get home. Some say Snorri could see the Men of Breidavik riding along Ulfarsfell as reinforcements to the Thorlakssons and that was why Snorri was keen to peacemake. 45 – The Battle of Vigra Fjord That winter Steinthor of Eyr with seven companions is loosing a boat in ice-bound Vigra Fjord when they see six man approaching, their enemies the Thorbrandssons. The Thorbrandssons climb a rock surrounded by massive shards of ice while Steinthor and his posse attack. After fierce fighting they lay all the Thorbrandssons low, only Freystein Bofi is dead (who he? ) but all the others badly injured and Thorleif Kimbi’s leg is chopped off. Snorri, alerted by his farmers, arrives and carries them all back to Helgafell and nurses them back to health. Thorleif Kimbi walks with a wooden leg the rest of his days. 46 – In the spring a lot of their neighbours work hard at the Thors Ness Assembly to make a settlement: elaborate pairings of injuries and killings make both sides about equal, and they shake on the deal, and the peace lasts while Steinthor and Snorri lived. 47 – That summer Thorodd the Tribute-Trader hosts Snorri to a feast and asks him to sort out the ongoing shame of Bjorn visiting his wife, Thurid, Snorri’s sister. Snorri decides they’ll attack and kill him and they ride to Kamb. Interestingly, Snorri uses the example of Gunnar’s last stand, in chapter 77 of Njal’s Saga, as an example of how one man can fight off an attacking crew. Daringly, Bjorn walks straight up to Snorri and puts his shearing knife to his heart and they discuss the issue. In a nutshell, Bjorn promises to stop bothering Thurid. Snorri and gang leave. Bjorn packs his belongings and takes ship at Hraunhaven. Nothing is heard of him for a long time, until the mysterious penultimate chapter 64, in fact. 48 – Snorri Thorbrandsson and his brother Thorleif Kimbi sail to Greenland where Thorleif lives to a ripe old age and Snorri voyages on to Vinland where he dies like a man fighting the Skrælings. Thorodd Thorbrandsson takes over the farm at Alftafjord and lives in peace. 49 – Christianity is brought to Iceland by Gizur the White and his son-in-law Hjalti. This is very briefly described, as if the author knew that other, fuller accounts existed (eg the five chapters in Njal’s saga). Snorri the Priest does more than anything to convert the Western fjords and it may be for this reason that the Christian author makes him the hero of the saga. 50 – Thorgunna arrives in a ship from Dublin, she being from the Hebrides. She is big-boned and stout and has a trunk full of treasures such as English sheets and hangings. Thurid of Frodriver (wife of Thorodd the Tribute-Trader and sister of Snorri) is madly jealous and invites her to stay though Thorgunna insists on working for her keep and angers Thurid by refusing to part with her wondrous belongings. 51 – Thorgunna joins in with raking the hay when there is a sudden shower and when it clears they see it was of blood. She takes to her bed dying and makes Thorodd promise to burn all her bedding. (In evidence of the lateness of composition Thorgunna asks to be buried at Skalholt which only develops into a centre of Christian learning and holiness in the 11th and 12th centuries). Thorgunna’s body is buried and Thorodd builds a fire to burn the bedding but Thurid begs him to keep it and he acquiesces. They carry the coffin a long way to Skalholt over rain-sodden moors in sleet, stopping at a farm named Nether Ness where the farmer gives them shelter but no food. In the middle of the night they hear noises and find Thorgunna stark naked making food in the kitchen. She brings it into the living room at which the farmer hastily welcomes then and Thorgunna walks out and vanishes. They eat the food she’s prepared and are fine. 52 – Back at the farm at Frodriver, once the coffin-bearers have returned, the household sees a weird half moon appearing on the wall. Thorir Wood-Leg says it is a fatal moon. 53 – Something starts haunting. It kills a shepherd. When Thorir Wood-Leg goes to the privy the shepherd’s ghost blocks his way and throws him hard against the door so that he sickens and dies. Now the two of them haunt. Soon farm hands start dying one after another. Thorodd goes fishing with five men. A ghostly seal appears, head first, emerging out of the floorboards at Frodriver, no matter what people do to it. 54 – Thorodd and servants put out to sea and are all drowned. When news arrives at Frodriver Thurid and Kjartan hold a funeral feast. At the height of the feast Thorodd and his men walk in drenched, dripping seawater. Everyone welcomed Thorodd and his men, and thought this a happy omen because in those days it was believed that drowned people had been well-received by the sea-goddess, Ran, if they came to their own funeral feast. At that time a good many heathen beliefs still prevailed, though people were baptised and supposed to be Christians. Thorodd and his men go sit by the fire. They do this every night till the fire burns low, then leave. After some days the guests all leave but Thorodd and his men still come and Thorir Wood-Leg now appears, along with the five servants who are buried, and they are all covered in mud and earth, which they start throwing at the drowned ghosts. Kjartan has the idea of building a long fire in the all and a smaller one in the household room, and the ghosts take the long fire and the household take the small one and this goes on all winter. An ox-tail is fond wagging in the fish pile which skedaddles away and all the fish are revealed to have been eaten, then Thorir Wood-Leg’s widow, Thorgrima Witch-Face, dies and another round of illness decimates the farm: six more people die and the rest run away. 55 – Not before time Kjartan goes to see his uncle Snorri who happens to have a priest staying with him. On Snorri’s advice they return to Frodriver on Candlemas, burn all of Thorgunna’s bedding, summon the dead to a door-court and charge them one by one. As the judgements are passed each ghosts leaves, saying they only stayed as long as they were let. Then the priest carries relics and sprinkles holy water into every corner and the dead men are banished. 56 – Snorri lived at Helgafell for eight years after Christianity came to Iceland (ie till 1008). In the spring Snorri exchanges farms with Gudrun Osvif’s-daughter and moves to Tongue in Sælingsdale, two years after Gudrun’s husband Bolli was murdered by Kjartan’s kin. Why? Though Gudrun hasn’t appeared in this saga yet, Snorri has already appeared in Laxdæla saga as a wise man Gudrun turns to. There it is explained Gudrun needs to get away from her vengeful neighbours and much the same motive drives Snorri, though his behaviour doesn’t change much after the move. It will be remembered that although Styr is the son of Thorgim Kjallakson (12), he does a deal with Snorri not to attack Eirik the Red (24) and keeps his word by not attacking Snorri after Vigfus’s murder (27), and asks Snorri’s advice about handling the berserks (28), as a result of which Snorri marries Styr’s daughter, Asdis. So when Styr is killed Snorri rides south with 400 men to avenge him. But he is met by 500 of his adversaries and there’s a stand-off. Snorri summons Gest for killing Styr but at the Althing their case is dismissed by Thorstein Gislason. Later Snorri rides south with 14 men and kills Thorstein Gislason and his son Gunnar. At the next Althing another Thorstein, of Hafsfjord, blocks Snorri’s plans and bad feeling quickly degenerates into a pitched battle. Ten or so men die until others step in and a comprehensive settlement is made. —This episode feels bolted onto the narrative, and the numbers (500 men!) and the unusual way the build-up to Styr’s death isn’t explained, make it stand out from the rest of the saga, much of whose interest derives from tracing the way trivial disputes snowball into massive feuds. This is another self-contained episode that could almost come from any saga, anyone’s life. Ospak is a rustler and after a lot of hassle Snorri is one among the many enemies he’s made who band together and kill him. The only failing in this otherwise excellent Penguin edition is that the map which excellently shows all the key locations on Snæfelsness peninsula, doesn’t show any of the locations of the Ospak episode, all of which (I think) happen to the north of Breidafjord. 57 – Ospak raids along the north coast with half a dozen men. He conflicts with Alf the Short and Thorir Gold-Hardarson. He has a fortified stead at Eyr (but not, apparently, the same Eyr as the one in Alftafjord). One day a whale is washed up. Alf and others cut it up, as they have driftage rights. Ospak and crew row up and start taking the already cut whalemeat: Thorir intervenes and Ospak knocks him out with the back of an axe. 58 – Ospak and fourteen men go to Thambardale and raid Alf’s house, stealing everything. Servants warn Thorir at Tongue who goes after them with eighteen men. A full scale battle in which Ospak strikes Thorir over the neck but hits his knife-on-a-strap, more fighting then Ospak and men run off to their fortified farm. 59 – Snorri represents Thorir and Alf at The Thors ness assembly and gets Ospak and crew outlawed. Snorri rides to enact the confiscation only to discover Ospak and his men have packed all their goods and sailed far north, where they set up a base and continue raiding. 60 – Snorri enacts the confiscation anyway and divides what was left of the belongings among Alf and Thorir. At summer’s end Ospak and crew sail south to Bitra, put in at Eyr and carry the loot to the fortified farm, where Ospak’s wife and son had remained. They sail onto Tongue in Bistra, drag Thorir out of bed and kill him on the spot, steal all his goods, then carry on to Thambardale, where Alf the Short hears them coming and esapes through a secret door. Again they loot everything they can and return to the fortified stornghold at Eyr, haul the boats inside and make it impenetrable. 61 – Snorri takes in Alf and his family and makes sure of the lie of the land. Just before Christmas he calls on Thrand Stigandi. 62 – Snorri calls on Sturla Thjodreksson and other neighbours till he has fifty men. At Tongue thirty more join and they ride north to Eyr. The fight starts with both sides throwing lots of stones. Finally Sturla’s spear knocks Ospak down and Sturla kills him, then they kill two more and the vikings surrender. Snorri gives them safe passage so long as they split up. He lets Ospak’s widow and son keep the farm. Glum marries Thordis, sister of Grettir the Strong, and their son was that Ospak who quarrels with Odd Ofeigsson (the plot of the Bandamanna saga). 63 – Another story or legend which could, frankly, be attached to anyone. We thought we’d heard the last of Thorolf Twist-Foot in chapter 34. Now, after all this time, he is back haunting farms at Ulfarsfell and Orlygsstad. Farmers call on Thorodd Thorbrandsson to help. He goes with slaves to Twist-Foot’s Knoll, break open the grave and roll Thorolf’s corpse down to the shore where they create a pyre and burn it. Coming back they witness a cow break a leg. They patch it up and let it roam on the hill where it seen frolicking with an unknown bull and licking the stones where Thorolf was burned. It gets pregnant and has a bull calf which grows with uncanny speed. Thorodd’s foster-mother, old and blind, predicts no good will come of it and they should slaughter it. But Thorodd deceives her, keeps it, feeds it as it grows into a monster and call it Glaesir. In the summer, after a heavy rain, Glaesir runs mad in the home meadow attacking the hayricks. Thorodd goes out to calm him, ends up wrestling with him and is finally tossed and gored in the guts. He limps home where he dies in bed. This same Thorodd was one of Snorri’s companions in the killing of Thorolf Twist-Foot’s noble son, Arnkel (37) and a participant in the Battle of Vigra Fjord (45). He is buried in the local church.— This story is a stand-alone anecdote which needn’t have been in the saga at all. 64 – A marvellously haunting and romantic chapter in which a man named Gudleif Gudlaugsson sets out from Norway in the reign of King Olaf the Saint (1015-30), heading for Dublin but is blown way off course by stormy winds, arriving at a big country where they are cpatured by hundreds of locals and dragged before their big grey-haired leader who, to their astonishment addresses them in Norse, asks after Iceland, then about the west fjords, then specifically about Thurid and her son Kjartan. He refuses to name himself but asks them to give Thurid a ring and Kjartan a sword, then bids them leave in a hurry before the locals kill them. Legend has it this man was Bjorn the Breidavik-Champion, who we first met making unwanted visits to Thurid, Snorri’s sister, back in chapter 29, before he was exiled and went to join the Jomsvikings. It is a strange and haunting almost-ending to the book. 65 – Snorri’s descendants The actual ending is a final chapter lovingly rounding up the descendants of Snorri’s many children.